My wife Mary came up with this scrumptious baked cod recipe one day while I was out getting my freshwater fishing fix for the day. She wanted to try something a little different aside from the usual foods that we eat, as well as an alternative for a deep fried cod fish recipe that we had just made a few evenings prior. She enjoys baking, especially when it comes to creating custom cakes for friends and family. Anyways, this is what she masterfully whipped up with for our dinner one evening. Pre-heat oven to 350°. Get 1 large piece of foil, or 4 individual pieces that are big enough to fully encase the cod fish fillets. Spray the foil with nonstick cooking spray, then set the fillets on the center of the sheet of foil. Sprinkle the fillets with the dill and the green onions. Mix the remaining ingredients in a small mixing bowl, then pour it over the cod fish. Fold the foil up over the fillets and crimp the edges to seal the wrap. 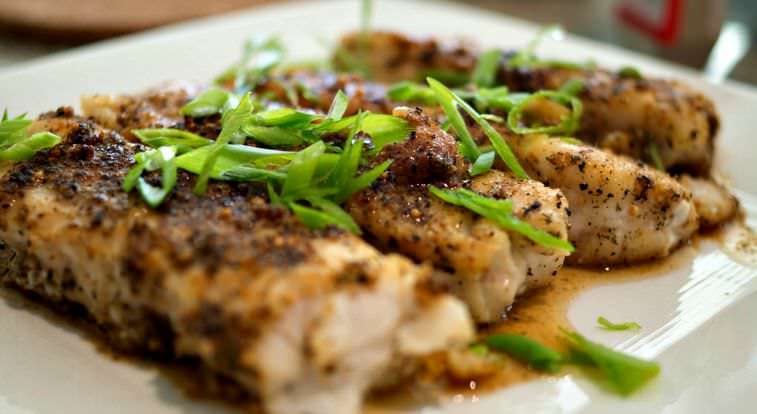 Place the foiled fish fillet packets on the center rack in the oven and bake for 10-20 minutes, or until it's done by flaking when tested with a fork. Serve and enjoy. Fun Tip: This recipe will also work well and taste really great on a charcoal or gas barbecue grill. This will give your fish those beautiful char marks and a nice smoky flavor that your taste buds love.